Fall is creeping in, and I’m thrilled. I found one stray can of pumpkin puree in the pantry, and decided it was finally close enough to fall to use it. 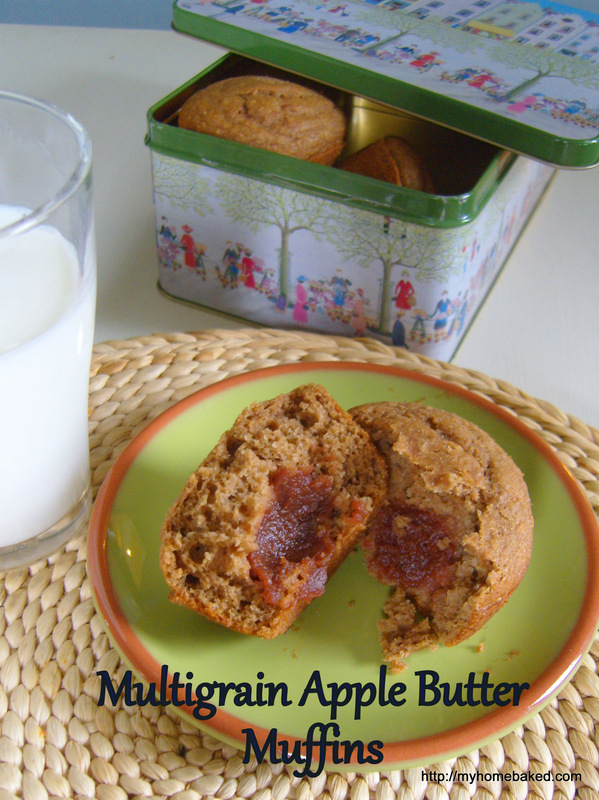 My family doesn’t seem to tire of muffins or quick breads, even when I stuff them full of whole grains and fiber. I’ve been meaning to mix up a container of multigrain flour, ever since I stocked the freezer with a beautiful variety of flours some months ago. And since I’m trying to cook in greater quantity, but less often, I baked enough for a loaf to eat right away, and some muffins to freeze for lunchboxes and quick breakfasts. 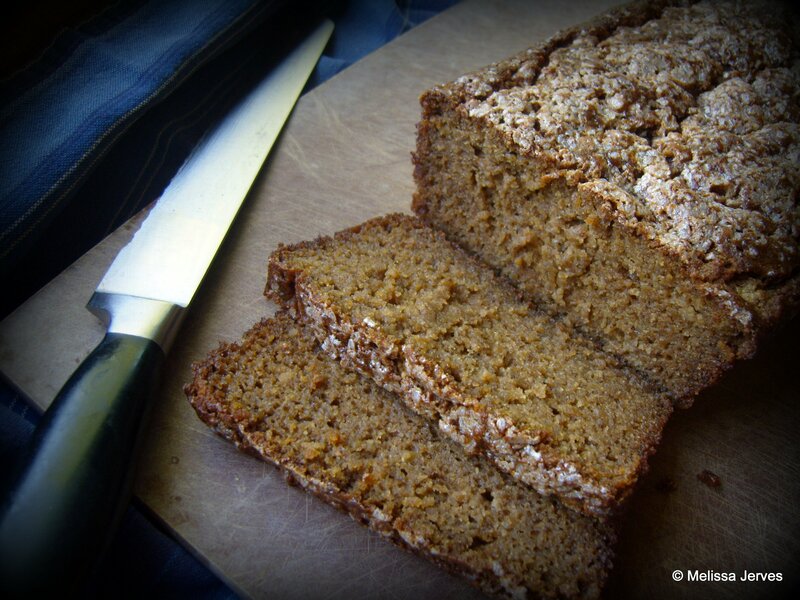 This bread is incredibly moist, with a complex, fruity flavor and something reminiscent of gingerbread. I am tempted to retest the recipe with less butter, since there is so much fruit to maintain the moisture. If you try, let me know how it goes! This recipe looked so easy (mix the wet ingredients, mix the dry, mix them together–done! ), but it needed some tweaking. If your ingredients are not all at room temperature, the butter will not mix smoothly into the wet mixture. I had cold eggs and overripe bananas straight from the fridge, and they didn’t play well with the softened butter. But if you cream the butter and the sugar together first, and then add the rest of the wet stuff, you’ll be fine. No extra bowls, either. 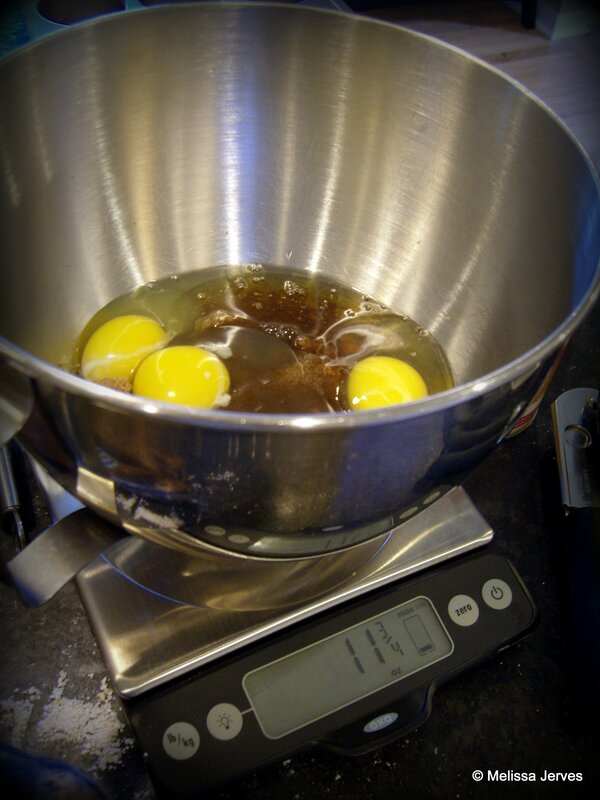 By the way, I finally acquired a kitchen scale, and I already love not having to use a slew of measuring cups. You can get along just fine without one, but I’m finding it more and more useful. Whisk all the flours together in a bowl, then store in an airtight container. Preheat the oven to 350 degrees. 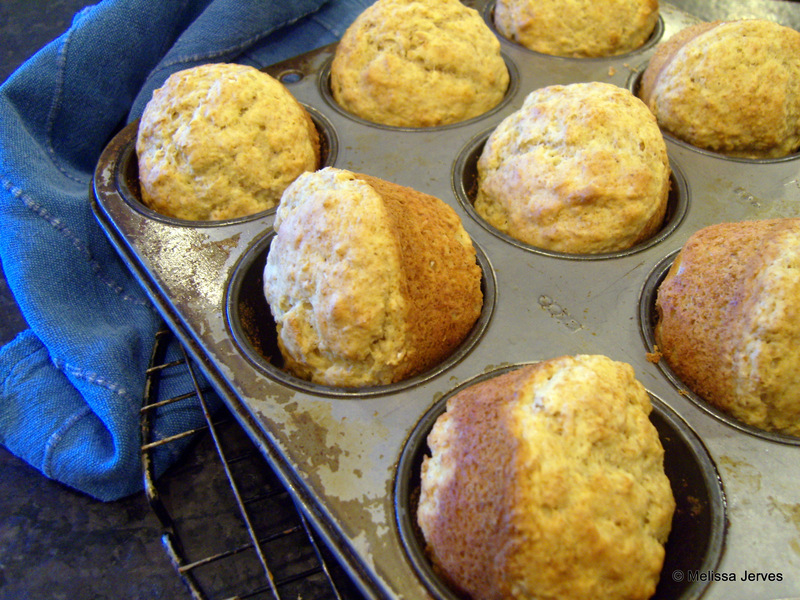 Grease the bottom of two 8 1/2″ by 4 1/2″ loaf pans (or one loaf pan and a dozen muffin cups). Beat butter and brown sugar together. Add the rest of the wet ingredients and beat well. In a medium bowl, whisk together the multigrain flour, baking powder, baking soda, salt and cinnamon. Add to the wet mixture and stir until just combined. 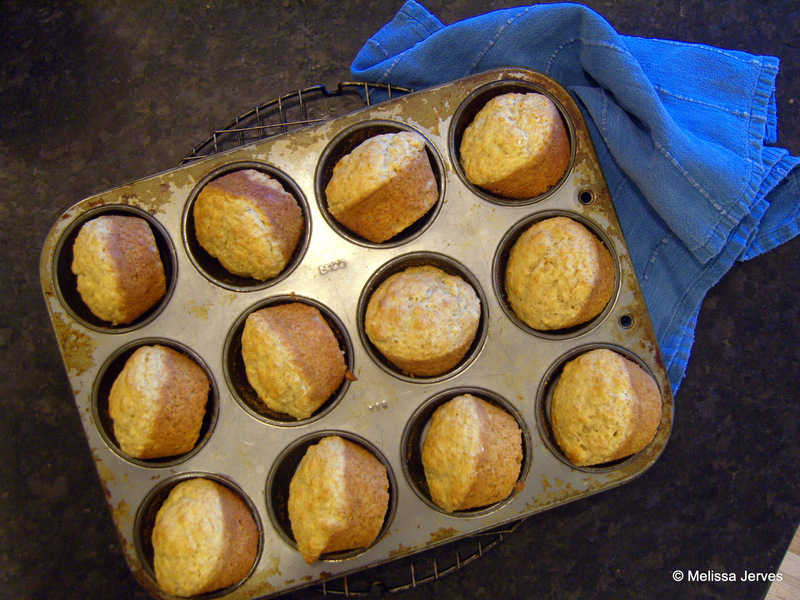 Fill the muffin cups 2/3 full of batter; then fill the loaf pan (it should also be about 2/3 full). Sprinkle the coarse sparkling sugar on top of both. Put both pans on the middle rack of the oven. Bake the muffins for 15-20 minutes, until a toothpick inserted in the center comes out clean and the edges look browned. Remove and cool completely in the pan on rack. Move the loaf pan to the center of the oven and bake for another 35-55 minutes. Cool completely in the pan. Summer always brings much-anticipated visits from friends and family, but if you don’t plan ahead, you can get overwhelmed and stressed out trying to feed all those extra mouths. I like to plan meals that are mostly made ahead (I don’t want to be in the kitchen while everyone else is having fun! ), with lots of built in flexibility so everyone can personalize their plates (especially important when there are a bunch of kids in the mix). With a fridge stocked with plenty of beverages and healthy snacks (yogurt, fresh fruit and veggies), and a good stash of homemade cookies, you’ll be ready to enjoy your visitors! Panini Night: 2 kinds of good sliced bread, 3 cheeses (I like cheddar, provolone and Havarti), some sliced deli meat, thinly sliced tomato, arugula, maybe a jar of roasted red peppers or some caramelized onions. Set everything out in little bowls and let each person assemble their own sandwich. I don’t have a fancy panini press; I just toast them on the griddle and press them down with a cast iron skillet. Add a salad and some chips! Pasta Night: Asparagus, goat cheese and lemon pasta (I realize this menu leans heavily on Smitten Kitchen recipes, but they’re always reliable!). Cook extra pasta and leave it plain for the pickier kids who want plain marinara or just butter and cheese. My kids like the goat cheese but pick out the asparagus. Garlic bread (use a big 1-lb. loaf of soft Italian bread to feed a crowd) and a simple tomato salad. Breakfast ideas: Doughnut Muffins (that’s what my kids call them because I make them in regular muffin tins) and smoothies; Spinach and cheese strata or Baked French Toast and bacon; Overnight Orange Rolls and Velvet Scrambled Eggs with Fresh Herbs. I love getting out of bed before the kids. It doesn’t happen very often. In fact, if I plan to get up before they do, someone inevitably hears and pops out of bed ready to start the day. So much for a quiet half hour with my coffee. But yesterday morning I hauled myself out of bed in a desperate attempt to silence the cat, who was going door to door, loudly trying to rouse someone to fill his empty dish. So. I was up, and my husband had already filled my coffee cup. A good time for some muffins, before the children started caterwauling, too. They came out of the oven just as the first riser stumbled down the stairs for her dose of morning television. Heat the oven to 500 degrees F. Grease 12 large muffin cups and set aside. Whisk the dry ingredients together in a large bowl. Whisk the liquid ingredients together well (I add them to a 2-cup glass measuring cup and whisk them right in the cup). Add the liquids to the dry ingredients and stir together no more than 20 seconds. I like to use a large spatula to make sure I scrape everything off the bottom of the bowl. Scoop the batter into the prepared muffin tin. Put the tin in the oven and immediately reset the temperature to 400 degrees F. Bake 15-20 minutes, or until the muffins are golden brown and a skewer or toothpick inserted in the middle comes out clean. Serve warm. Saturday morning we packed up the kids and went to our first farmer’s market of the summer. I think it might have been the first time in eight years that we did not take a stroller. Another milestone. We came home with a bag of multi-colored fingerling potatoes, two big bunches of asparagus (some of which turned into this salad), and a pint of blueberries. 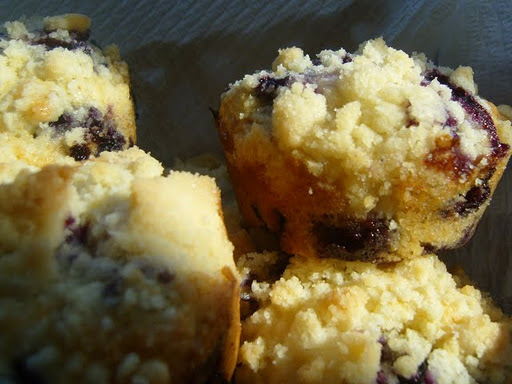 After sampling a few (not a sour one in the bunch), I used the whole box in my favorite blueberry muffin recipe on Sunday morning. 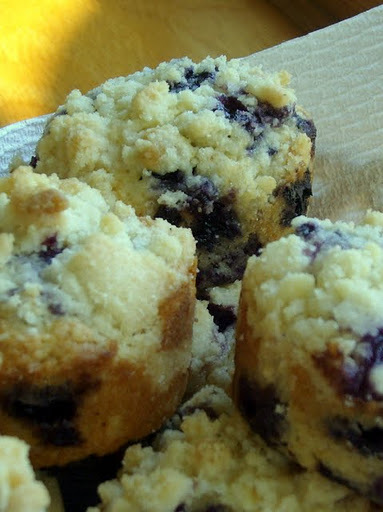 The muffin batter is really just a means to bind the blueberries together, topped with a buttery crumb topping. These are not sturdy muffins that would survive a child’s backpack; these are delicate and tender, best still warm from the oven and borne gently to the breakfast table in a basket. (I bet Dad wouldn’t mind them, along with a cup of coffee and a handmade card, on his tray for Father’s Day breakfast in bed.) Frozen berries will not do. Save this recipe for the best fresh blueberries you can find. Heat the oven to 375 degrees. Grease 12 muffin cups. Melt butter in microwave or in a saucepan over low heat. Whisk in milk, egg and vanilla until well combined. In another bowl, whisk together flour, sugar, baking powder and salt. Add liquid mixture and stir until just combined. Fold in the blueberries. Scoop the batter into the muffin cups. Combine the topping ingredients in a small bowl and rub together with your fingertips until it begins to crumble and clump together. Sprinkle the crumb topping evenly over the muffin batter. Bake until golden and crisp, and a wooden pick comes out clean, about 20-22 minutes. Cool in the pan on a rack for 10 minutes, then run a knife around the edges of each muffin and carefully remove from the cups. Serve warm.